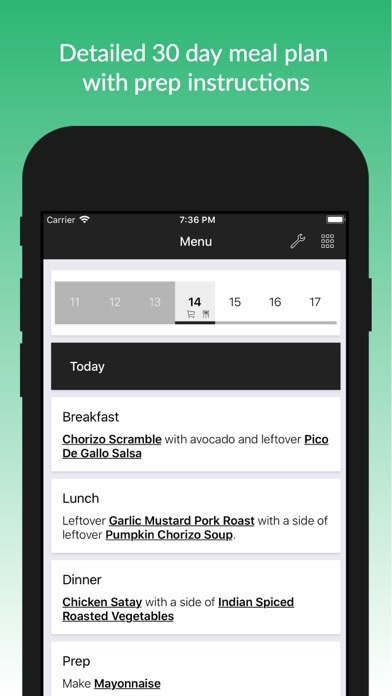 This app is the ultimate tool for 30-days of whole-eating. By following the 30-day set menu of clean proteins and vegetables and using the handy, pre-made weekly shopping lists and daily prep instructions and recipes, you will be able to clean up your eating habits and feel great without all of the legwork. 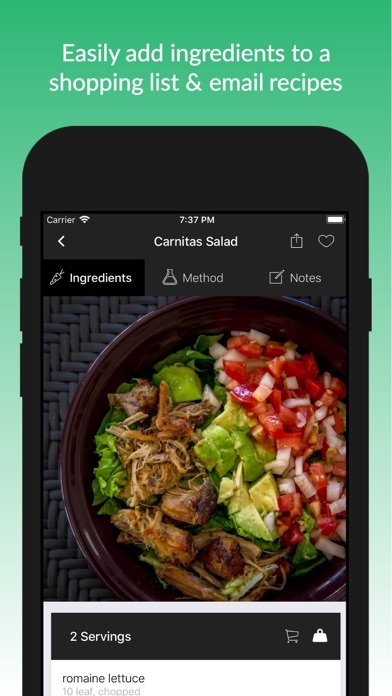 Features: * Menu * This app includes a set meal plan for 30 days of scrumptious whole 30 compliant eating. 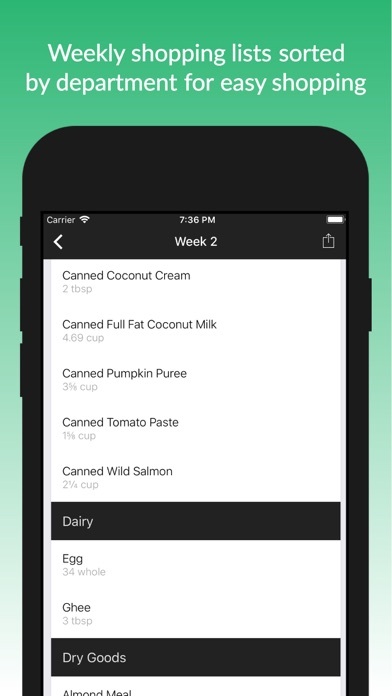 * Shopping Lists * Each week's shopping list is pre-made for the meal plan in the app. 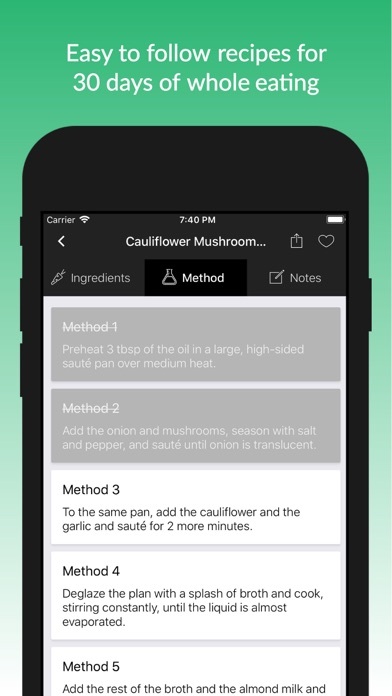 You can also browse the recipes and add the ingredients to your own custom list. Create and name as many custom lists as you'd like. Shopping is done once a week on days 0, 7, 14, and 21. You can start the 30-day plan on any day you'd like to make sure your shopping and bigger prep days fall on a day that is convenient for you. Meals on a shopping day will use food from the previous shopping list, just in case you can't shop until the evening! * Prep Instructions * There are prep notes throughout the app, and usually, some general prep work on your shopping day to prepare for the week of clean eating ahead of you. For example, if a meal calls for hard boiled eggs there may be a prep note letting you know to hard boil a larger batch for use later in the week. 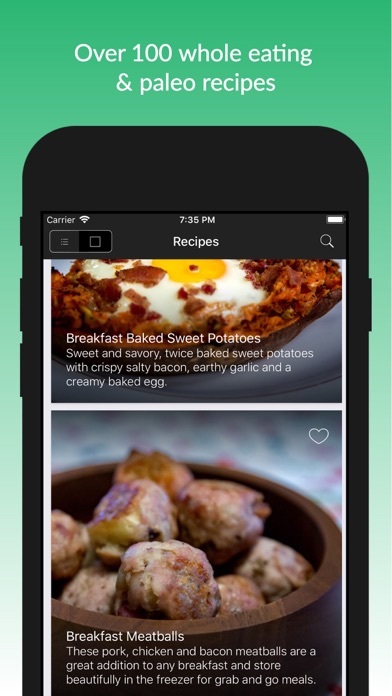 * Recipes * This app has over 100 whole-eating recipes, with beautiful photos and easy to follow instructions. You can e-mail recipes or add the ingredients to a shopping list with one button click! Recipes include: 1. Meat, poultry, and fish. Everything from bun-less burgers to fish taco salads 2. Eggs (your breakfast BFF) 2. Veggies. Limitless veggies eaten raw, roasted or riced. 3. Fruits. A fruit a day keeps your sweet tooth at bay. 4. Fats. Avocados, nuts or oils. Every. Single. Day. What these recipes don't include: 1. Dairy (except for ghee). 2. Grains 3. Alcohol 4. Legumes 5. Added Sugar 6. Carrageenan, MSG, and Sulfites NOTICE: This app is not owned by, affiliated with, or endorsed by Whole30 or Whole9 Life, LLC. Neither Whole30 nor Whole9 Life, LLC have approved of any of the material contained herein, and do not verify, warranty, or confirm its accuracy. Please visit www.whole30.com or purchase The Whole30 for all information relating to the real program. No license has been granted by Whole9 Life, LLC or Whole30, and all trademarks and copyrights belong to the registered owner. Nothing herein constitutes a waiver of any rights available to Whole30 or Whole9 Life, LLC.